Green Tech Coatings, based in La Quinta, California, was created to address the rapid increase in energy costs as well as the need to become more eco-friendly in today’s world. We are a wholesale and retail distributor for Insuladd® Radiant Barrier products, serving California, Arizona, New Mexico, and Texas. Insuladd® insulating additive utilizes the very latest in ceramic microsphere technology, which was originally developed by NASA for use on the space shuttle tiles. As a result, the Insuladd® insulating paint product line was created through the NASA Technology Exchange Program. Insuladd® insulating additive is a radiant barrier paint additive that insulates (reflects heat) the exterior and interior of your home or business as you paint. It is environmentally friendly, safe and non-toxic, and simple and easy to use. Pre-mixed products include Insuladd® E-Coat - a "cool roof" elastomeric roof and wall coating as well as Thermal Block and RBC - spray on radiant barrier paints for your ceilings, walls, and attics. These products help keep your home or business cool in the summer and warm in the winter. Insuladd® E-Coat, which is Energy Star qualified when used as a roof coating, can even decrease the temperature of your roof surface up to 100° in the summer. 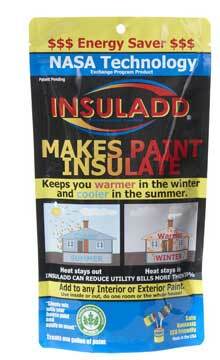 Insuladd® insulating paint additive has been making homes, businesses, warehouses, ships, etc. more energy efficient for over a decade. Homeowners and building contractors have proven Insuladd paint additive is not only highly effective in making insulating paint, it's simple to use for any homeowner. Worldwide users of Insuladd® insulating additive such as the Climatic Test Branch of the U.S. Missile Command, Pratt & Whitney Aerospace, Hyundai, Samsung, The U.S. Navy, The U.S. Coast Guard along with 1,000's of homeowners have proven Insuladd's value as an insulating paint additive under the most intense conditions.